UPDATE: John Williams builds up his London base. I’m surprised he didn’t choose an LA music school with a film scoring program. Would some reasonable person please explain to me what value all this paper could possibly contain? Without assuming any mantle of greatness for Williams. There are Korngold’s scores, Maurice Jarre’s mysteriously wonderful score for Witness written for up to eleven synthesizers of the day, the music for the silents, which can now be attached to digital versions … but in general I can’t see the use of post-production movie detritus. When we composers study composition and orchestration, we start learning the form, or the structure of music, combinations, what sounds good with what, for example, the violins and flutes in the upper register will make the strings sound sweeter, compare to just have the violins itself. There are certain ranges in instruments that sound horrible, but those same ranges create effects that are used in film music very often for the same purpose, to create an effect. John Williams belongs to the golden age, where in order to make it you have to be really really good, his vast knowledge of orchestration and composition from his collaborations and the fact he worked with many great orchestrators from the previous century is priceless. Those papers are endlessly valuable. John Williams is quite simply one of the greatest musical minds the world has ever seen. Please, debate me on this, I dare you. His musical works, particularly his many amazing film scores, are easily the best and most prominent of the many existing film scores. His work stands out in the last century, and again when looking at all time. Every single score brings something new to the table, something notable. The one exception I can find is his most recent Star Wars score. I found most of the new stuff in that as kinda meh. Anyways, those papers are a look into his mind, a look into how he has done what he has. So much can be learned from the sketches alone. 37 Oscar nominations in 212 contributions for his musical work for film. Nobody has ever been more successful in creating music for that medium. His notes are a documentation of that process and will leave endless clues and suggestions for anyone with the same ambition. Hopefully students will finally be able to do comparative studies with the Holst collection. And Walton, and Debussy, and…. He does have his moments. I’ll grant him that. Overall I find his work rather meh. At the very least, it’s about as exposed to “classical music” as most of the general public will get. It’s not saying much, but it’s better than the alternatives. There are so many composers he supposedly copied it’s as though he didn’t plagiarise any but instead forged an eclectic style based on the best of the past. Who does this remind you of? Bach! Yet when Bach did the same, he usually greatly improved upon the borrowed material. I’d say Williams often did the same and suggest you listen to more of his scores. Why I feel so not-a-part of much of the ‘arts culture’ of my day. The announcement of this incredibly generous bequest to Juilliard is met in the comments with snarky jabs at both him and the school. Congrats to both Mr. Williams and the school! As for the rest of you, take a few years off from social media, and write even one-tenth of the output that this gent has produced, as his level of artistry. Then come back and snark away. Why write try writing one tenth when you can just copy and paste 100% before noontime? Wes Ramsay, you are absolutely right. Classical music will be resigned to the dustbin if classical music elites keep behaving like this. Luckily, everyone from preschoolers to the elderly (Masterpiece Theater, The Today Show theme, etc…) knows this amazing work. It’s wonderful and will outlast us all. I don’t think John Williams is trying to better any of the composers he’s “copied” – but his audience is learning the language of those composers, and it just might make them love those composers more. As well as understand the power and importance of an orchestra. Everyone enjoy it while it lasts. Once Williams goes, it’s nothing but wall-to-wall Zimmer knockoffs. Then you’ll have something to whine about. ^ This. Williams could at least write 3 and 4 note chordal harmony that still didn’t bury the voices. Zimmer and friends keeps writing vague 2-note things in order to avoid that kind of hard work. Nice fanfares on occasion (Pirates, though the most famous was a Badelt melody), but I’d never expect something as harmonically rich as Close Encounters out of Zimmer, ever. Maybe Giacchino might get there when suitably inspired, but only if he’s not in a hurry (Giacchino’s problem is he takes too many commissions at a time, so none of them have the time to get his full attention). Fair point. Although at his best, Zimmer does resort to copying better composers. And at least he had the guts to try to copy Gerard Grisey on at least one occasion before he turned to churning out glorified video game soundtracks. What is implied in your comments is that films are better than Zimmer can produce by way of a score. Most films these days are actually uplifted by Zimmer’s music, or anybody else’s. Now, that’s not saying much for Zimmer but when we compare modern films with those of the past they are found wanting. Sure, there was rubbish in the past; lorry loads of it. But today it’s wall-to-wall schlock, violence, sentimentality, usually poorly scripted and mechanically acted and destined for the undiscerning megaplex audiences. Even the good ones just aren’t too good, being too preachy and pc for my tastes. The last time I went to the cinema was to see a documentary, “In Search of Beethoven”. Now, THAT had a very good musical score!! 🙂 Most of the modern films I catch on the usual available online places. There are gems, of course, for example “About Schmidt”; that was a rose amongst thorns. And “As Good as It Gets”. Wonderful. You can have the rest!! It’s a shame they’re going to Juilliard. It was a great school back in the day – when artists such as Robin Williams and Itzhak Perelman were in attendance – but I know teachers who’ve left the school because of its nasty politics. All schools are political, but Juilliard is particularly notorious. If I were Mr. Williams, I’d have given the scores to USC, a real film score school. It’s alumni include James Horner, James Newton Howard, and Bear McCreary, not to mention Elmer Bernstein and Jerry Goldsmith. My bias is still John Eilliams. He’s a modern cross of Tchiakowsky’s lyricism and Wagnerian form. 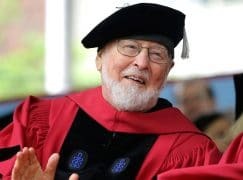 Wouldn’t it be nice if the comments included a warm thank you to John Williams for making his scores available to students who want to study his method and music. Films and film music are a part of the cultural fabric of the 20th and 21st Century and persistent snarky comments only illustrate the depth to which discourse has fallen. His offer is generous, but let’s be honest, accusations of more or less copying other composer’s music has dogged him throughout his career. Even his concert works resemble that of other composers. That’s the problem: nothing really stands out in his oeuvre has a consistent voice. It’s always a pale reflection of something we’ve heard before that was better. Some of his concert works are okay, but they really aren’t as well thought out. This is most perplexing considering he studied with Mario Castelnuovo-Tedesco. And Castelnuovo-Tedsco was a brilliant composer of both concert works and music for movies. If only Williams had been more like him. He is sometimes constrained by the director’s choices. Star Wars in particular was heavily influenced by Lucas’s attachment to the demo score he put together (in order to have a print he could use to show the bankers to get some more money to finish the darn thing). The same demo score approach that Kubrick had done in 2001, only Kubrick got so attached to it that he threw out Alex North’s work and just kept the classical and Ligeti stuff (and didn’t tell North at the time). Thus why the final battle has Mars-like 5/4, and the Tatooine scenes sound like part 2 of Rite of Spring (itself because Lucas associated the sound of that opening with the desert thanks to Disney’s Fantasia). There’s a bit of Copland in it as well for similar reasons (though Williams is more Copland-esque in Jaws). So he didn’t really get to put a real personal stamp on Star Wars saga until Empire, I think…and even then, became constrained by the same Wagnerian approach that informed it. The best pieces from the scores, in hindsight, are often ones that didn’t involve the standard motives we know so well. E.g., the 2nd part of the 4-part “Battle of Hoth” sequence. Close Encounters comes closer to an original voice, I would think, than most of his other films. True indeed, sir. It is a gift. I stand by my position that they should have gone to usc, however. Er…shouldn’t we respect his right to donate it to anywhere he wants? And while I myself am not much interested in the music, it has nevertheless given pleasure to millions. And that is something we should also respect. I love his scores to The Eiger Sanction, and Earthquake. The National Symphony Orchestra here in Washington DC will be playing the soundtracks of four of the Star Wars “episodes” next season (a total of 13 performances). Sure, it will bring The People into the concert hall, but will they come back for Holst, Mahler, and Walton? And how do the Kennedy Center honchos make that happen? Um…why should we value concerts only because they bring people to other concerts that sometimes are considered more worthy? Why not let the people who enjoy Williams’ music enjoy it on its own terms. And those of us who prefer Mahler can enjoy Mahler’s music for its own sake, rather than view it as a stepping stone to Beethoven…or Williams. I know there are the naysayers above, but to be honest, Williams was my real entry into exploring classical more deeply. Sure, I had Fantasia, and the standard ‘kids’ pieces like Beethoven’s 5th, Mozart’s night music, Peter and the Wolf…but given my druthers I was, as a sophomore in 1985, falling back on Empire Strikes Back very often. Eventually, i felt the drive to go “where did this come from?”, and gave in – I picked up a Rite of Spring recording (Bernstein, Israeli Phil), Holst’s Planets (Bernstein NYPO), and began a very deep listening to a Beethoven’s 9 that my dad picked up (Dohnanyi, Cleveland Orchestra, still one of my favorites), and I was hooked. Then out of college and finally with real spending money, and thanks to Bernstein (his young person’s concerts), the obligatory dip into Mahler. That pretty much settled it – there was this wonderful “film” music, yet without the baggage of actually having seen a film for it. The visuals, the feelings, they were all MINE, not some other director’s. I understood where it all came from, and decided to go deeper there than staying on the pop-classical surface of film scores (though I still get a few, because they can still be fun in their own). Bernstein’s Harvard Lectures and Rattle’s Leaving Home putting me on a permanent love affair with modern music, at that. So yeah, not everybody will be gripped enough by Williams to go deeper into the classical and modern-orchestral world, but it DOES happen. Best to keep encouraging it than knocking it. I’ve even gotten a few to join me in this – I played Webern’s 5 Pieces to some classic series Star Trek fans, side by side with some of the background music that Courage composed for it, and they couldn’t tell the difference. One of them picked up the Boulez “Everything Webern” boxed set the next week. I guess the trick is how you present it. You can slag off Williams as a hack, you can say “he stole this from X, he copied this from Y”, and make people feel bad about enjoying his work. OR you can say “hey, if you like that, close your eyes and listen to this…” and play the Debussy, the Stravinsky, the Holst, the Ravel, the Berlioz, the Wagner, the Bruckner, the Mahler, the Copland, the Shostakovich, even the Korngold. Williams doesn’t need to be replaced in the minds or the attentions of new listeners. Williams can be enhanced by an exposure to them, and vice versa, an understanding of them can be achieved by tapping into the comfort that people have with Williams. It is all in the attitude. The film scores of today can be a key to the deeper music we all agree we love and prefer, but only if you open doors with it, rather than shutting people out by telling them their favorite composer is just a second-rate hack. Also, because of him, I became interested in Korngold and the Raymond Scott Quartet, and because of that, my then 4-year old and 1-year old, I kid you not, started wanting to hear John Williams, and Korngold and the Raymond Scott Quartet. It would never have occurred to me to try to introduce them, but they were in the car at the time and started to request it. Then I found a documentary of Rosina Lhevinne and my now 9-year old son wanted to watch it because she was John Williams’ teacher. Then, we became interested in who Josef Lhevinne was, which got us curious about Rachmaninoff. I have long said, “John Williams is the gateway drug to classical music”. I have taken the kids to see him at the Hollywood Bowl several times, and my 5-year old announced, “Best Day Ever!” (At a classical music concert, not Disneyland?) We would guarantee generations of audiences for classical music (which at the end of day is what we need!! ), if all kids were introduced to it while using their lightsabers at a live symphonic concert, like mine were. Nailed it. This comment section is salty, and factually incorrect. He’s borrowed no more than Dvorak did from Beethoven. His music is a gift from the gods. The man has been and will always be an infinite fountain of irresistible, eternal melodies. Also a great orchestrator, even better arranger. And what a nice gesture to donate all his scores to the school that first helped shape his talent. So he quoted a few composers in a few of his scores. Which composer hasn’t? His contributions to popular culture now cover 60 years. They’re so gigantic, his music so iconic and recognizable that his work will be performed and remembered for centuries to come, long after you internet nobodies are dead, buried and forgotten. John Williams will up there with the gods of music. Good for Juilliard. An auction can save the school in some future economic crisis (they would certainly find some very cultured rich people who would love to own “the real thing”). Juilliard? I’m surprised he didn’t leave it to the venerable Library of Congress in Washington DC where in no circumstance would it would be sold off. No offense Juilliard but you treat 99.9% of your alumni like ghosts. Once we graduate we disappear forever from your radar screen. Amen. Juilliard in economic crisis? Time for the old to make way for the new. There’s a reason why’ they’re in crisis. Orchestras in crisis make me scared, but I think those who are moving on and putting on live performances of films and video game music – where music is going – will do just fine. And I look forward to it! I LOVED playing the Star Wars suite, and watching the Hartford Symphony perform the music from final fantasy, with the cut scenes up on screen. Is this a ‘film music isn’t as important as concert music” thread? If it isn’t, and we’re all willing to give movie music equal footing, there isn’t a more influential, prolific, or important film composer since the golden age—Korngold, Herrmann, etc.